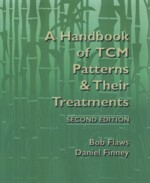 This book is the second, revised edition of a practical handbook of Chinese medical patterns with their disease causes and mechanisms, signs and symptoms, treatment principles, guiding formulas, main modifications and acupuncture treatments. It is meant for both the student and the clinical practitioner. The authors have included numerous patterns previously not described in the English language literature as well as many complex patterns which are commonly seen in real-life practice in the West. It also includes a symptom-sign index and a formula index for easy reference. All the medicinal names in the new edition conform to Benksy et al. 's Chinese Herbal Medicine: Materia Medica, 3rd edition and all Chinese medical terminology corresponds to Wiseman and Feng's A Practical Dictionary of Chinese Medicine. Ingredients in Chinese medicinal formulas begin with their pinyin names and are listed down for easier reference. In addition, this new edition contains a number of case histories for use in problem-based learning (PBL) along with suggested answers, thus making it even more useful in the classroom.